Hi@everyone, we are happy to announced that version 1.2.0 of the Lunarium wallets has been released. This is a mandatory update for all wallets and masternodes. At block 400,000 those that have not updated will be kicked out of the network. I estimate that block 400,00 will be on 2019-05-21 so there is no urgency to update but please don't wait until the last second. Before updating, it's highly recommended to backup any wallets holding coins and save to a few safe places. Fix for the masternode budget system. Live at block 400,000. Auto shutdown if the protocol is outdated. https://github.com/LunariumCoin/Lunarium-MN-Install & https://github.com/LunariumCoin/Lunarium-MN-Upgrade-Script has also been updated to reflect the latest version. Hi@everyone, http://explorer.lunarium.io/masternodes was updated to show protocol version to easily keep track on how many Masternodes that are running older versions. I noticed that 13 Masternodes are running an old version so to ensure that the network is stable can you please update to the latest version please. Hello@everyone. I just want to welcome @299006618249461760> as a new member of the @&437663101580738572>! Thanks to be there to help us out building Lunarium into a great coin! @everyone please go ahead and upvote XLN if you want us to get listed on BlockFolio! Hi@everyone, just wanted to let everyone know that @389856363192516619> is the latest addition to the @&435491972636213248>. @219550797581516800> has also started compiling the new wallets which we hope to have released soon. Hi@everyone, unfortunately there appears to be an issue with some masternodes hanging after the latest security update to version 1.1. Basically masternodes go missing in the hot wallet and hangs on the VPS using max CPU. lunarium-cli also won't respond. For now, a quick fix to get your masternodes gone missing restarted is to kill the process on the VPS with "killall -9 lunariumd". If your masternode is installed using the official script the dameon should then restart on it's own. Wait a few minutes and then restart the masternode from the hot wallet. We did test the latest version on the testnet but never encountered this issue which we hope to have a fix for soon. Hi@everyone. For those having their Masternodes installed using the official script you can use https://github.com/LunariumCoin/Lunarium-MN-Upgrade-Script to upgrade your nodes. Please note that the Masternodes has to be restarted from an updated hot (controller) wallet. Evening@everyone as you may be aware, a series of vulnerabilities have affected many cryptocurrencies derived from PIVX, and Lunarium has been affected along with many others. Over the last couple of days, the team have implemented the fix of which we are affected by, and have been testing it on our test network throughout the last 24 hours with promising results. However, an implication with this fix is that it is a mandatory requirement to upgrade your wallet to the latest version (v1.1.0), as consensus rules have been changed on how blocks are handled. Without a soft fork, the consequence would be a chain split, which you might see now with other projects. The soft fork for the Lunarium network will become active at block 250,000, which is approximately just over a week from now. We highly suggest that you update your wallet(s) now so that you do not have any issues to deal with once the fork has been initiated. It is as simple as downloading the necessary binaries for your system, and overwriting your current installation. Please be sure to backup your wallet.dat just in case something goes wrong. Once installed, you should be able to interact with the wallet like you normally would. For masternode operators, it is suggested that you update your controller wallet first, and then all subsequent nodes afterwards. Thank you! And if you have any further queries, please do tag @&435491972636213248> and we will do our best to get back to you. Have a great week! Hi@everyone. As some of you may have noticed the TipBot crashed the other day and it appears the MySQL database keeping track of everyone's balance are corrupted and not recoverable. That said, all 27,715 XLN are in a normal Lunarium wallet and are not lost. On 2019-01-13 I did make a backup of everyone's balance into a text file and it appears that since then there has been no activity with the TipBot . To recover your balance please send me a message with an XLN address where I can send your Lunarium. Requests will only be accepted from the Discord ID that held the balance with the TipBot . Thanks for your understanding. If the TipBot later return it will be under a different SQL database server. Big thanks to @!389856363192516619> for getting us listed on MN ROI. Download MN ROI Android app and Check Masternode Status from Pocket. Most accurate and Fully Detailed Masternode coin website which give you accurate result of your masternode coin. Compare more than two coin for better understanding. Also Monitor your Masternode coin in free of cost. @everyone I will be raining and soaking 13,000+ XLN on active members starting at midnight tonight (Eastern Time) and during the day (Jan 1st 2019). I will be probably joined by other members of the @&435491972636213248>. 😄 Happy new year guys! Hi@everyone, please be aware that the listing on masternodes.pro expires on 2019-01-06 and they have asked for 0.1 BTC to extend the listing for another year. While we appreciate the service masternodes.pro has provided up until now, the @&435491972636213248> does not feel that this fee is worth paying considering us also being listed on masternodes.online which according to Alexa has about 7 times more traffic. That said, if anyone wish to donate funds for us to remain listed on masternodes.pro please let us know as soon as possible. 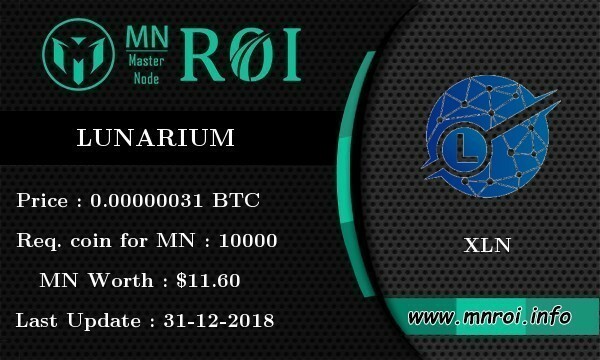 Lunarium XLN price graph info 24 hours, 7 day, 1 month, 3 month, 6 month, 1 year. Prices denoted in BTC, USD, EUR, CNY, RUR, GBP.